Astrophysicists at MIPT have developed a model for testing a hypothesis about supermassive black holes at the centers of galaxies. The new model enables scientists to predict how much rotational energy a black hole loses when it emits beams of ionized matter known as astrophysical jets. The energy loss is estimated based on measurements of a jet's magnetic field. The paper was published in the journal Frontiers in Astronomy and Space Sciences. Astrophysicists have observed hundreds of relativistic jets—enormous outflows of matter emitted by active galactic nuclei harboring supermassive black holes. The matter in a jet is accelerated nearly to the speed of light, hence the term "relativistic." Jets are colossal, even by astronomical standards—their length can be up to several percent of the radius of the host galaxy, or about 300,000 times larger than the associated black hole. That said, there is still a lot researchers do not know about jets. Astrophysicists are not even sure what they are made of because jet observations yield no spectral lines. Current consensus holds that jets are likely made of electrons and positrons or protons, but they remain quite a mystery. As researchers obtain new data, a more comprehensive and self-consistent model of this phenomenon is gradually emerging. The matter orbiting and falling onto a black hole is referred to as the accretion disk. It plays a crucial role in jet formation. A black hole, together with its accretion disk and jets (fig. 1), are thought to be the most effective "machine" for converting energy. If we define the efficiency of such a system as the ratio of the energy carried away by the jets to the energy of the accreted matter, it may even exceed 100 percent. Nevertheless, a closer look at the system reveals that the second law of thermodynamics still holds. This is no perpetual motion machine. It turns out that part of the energy of the jet comes from the rotation of the black hole. That is, by powering a jet, a black hole spins progressively slower. In a way, this seeming perpetual motion is more like an electric bike. There is an apparent mismatch between the input energy of the accreting matter—muscle work, in the case of the biker—and the output energy of the jet, or the motion of the bicycle. In both cases, though, there is an additional hidden energy source—namely, the battery powering the bike's electric motor and the rotation of the black hole. Via accretion, a black hole gains angular momentum—that is, it starts spinning faster. Jets carry away some of this excess angular momentum in what is known as rotational energy extraction. Similar effects are observed in young stars. During the formation of a star, it captures the matter of the accretion disk, which has enormous angular momentum. However, observations show such stars actually rotate rather slowly. All of the missing angular momenta is used up to power the narrow jets emitted by these stars. Scientists have recently developed a new method for measuring the magnetic fields in the jets emitted by the active galactic nuclei. In her paper, astrophysicist Elena Nokhrina showed that this method can be used to estimate the contribution of black hole rotation to jet power. Up until now, the formula for the channeling of rotational energy into the energy of the jet has not been tested empirically. Unfortunately, no reliable observations so far have captured black hole rotation rate, which is important for estimating the loss of rotational energy. A black hole does not have a magnetic field of its own. However, a vertical magnetic field is generated around it by the ionized matter in the accretion disk. 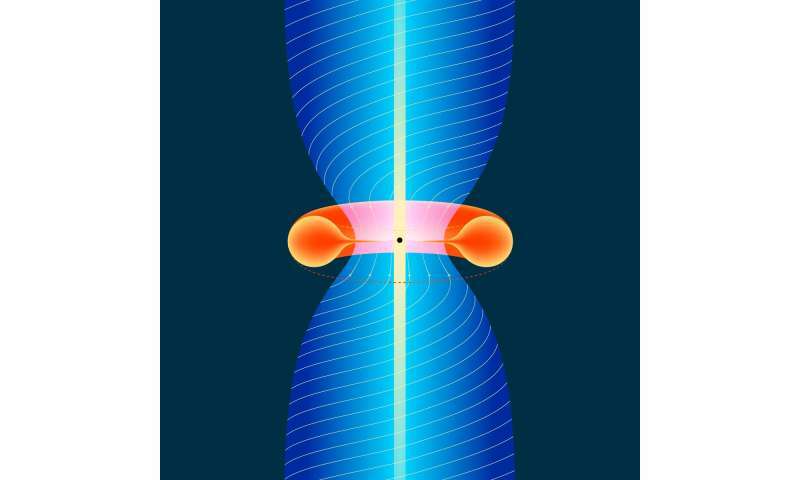 To estimate the loss of rotational energy by a black hole, scientists need to find the magnetic flux through the boundary around a black hole known as the event horizon. "Because the magnetic flux is conserved, by measuring its magnitude in the jet, we also learn the magnetic flux near the black hole. Knowing the black hole's mass, we can calculate the distance from its rotation axis to the event horizon—its notional boundary. This allows us to estimate the electric potential difference between the axis of rotation and the boundary of the black hole. By accounting for the electric field screening in plasma, it is possible to find the electric current near the black hole. Knowing both the current and the difference of potentials, we can estimate the amount of energy lost by the black hole due to the slowing down of its rotation," says Elena Nokhrina, the author of the paper and deputy head of the relativistic astrophysics laboratory at MIPT. The calculations point toward a correlation between the total power of a jet emitted by a black hole and the loss of rotational energy by the black hole. Notably, this study makes use of a recent model of jet structure (fig. 2). Before this model was advanced, researchers assumed jets to have homogeneous transverse structure, which is a simplification. 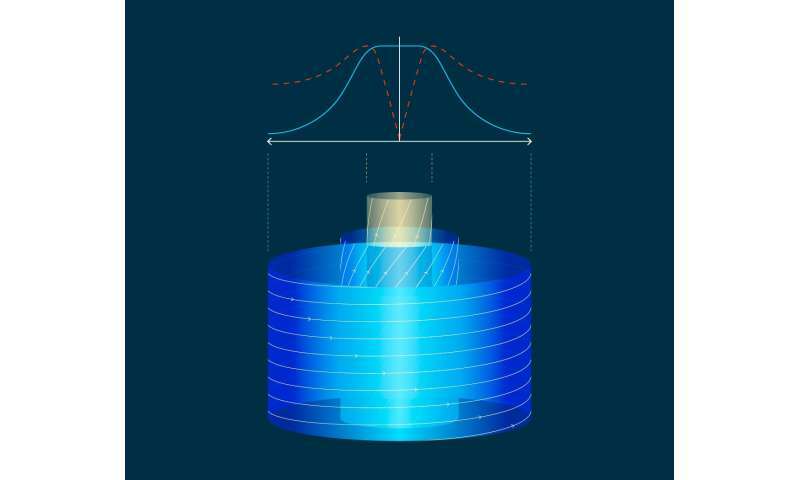 In the new model, the magnetic field of a jet is not homogeneous, enabling more accurate predictions. Most of the galaxies hosting jets are too remote for the transverse structure of their magnetic fields to be discerned. So the experimentally measured magnetic field is compared with its model transverse structure to estimate the magnitude of the field's components. Only by taking transverse structure into account is it possible to test the mechanism of black hole rotation powering jets. Otherwise, it would be necessary to know the rotation rate. The hypothesis that was put to the test in the study states that jet power depends on the magnetic flux and the rotation rate of the black hole. This makes it possible to gauge to what extent a jet is powered by rotational energy. Notably, this theoretical work enables us to estimate how much rotational energy is lost by a black hole without knowing its rotation rate—using only the magnetic field measurements of the jet. So where are some representative numbers? That said, there is still a lot researchers do not know about jets. Astrophysicists are not even sure what they are made of because jet observations yield no spectral lines. Current consensus holds that jets are likely made of electrons and positrons or protons, but they remain quite a mystery. Above article/study clearly acknowledges the crucial role of ELECTRIC CURRENTS in astrophysical phenomena involving plasma flows and fast-electron currents creating/enhancing the observed behavior of the matter-energy conversion/re-distribution etc dynamics. At least the mainstream is 'catching up' to reality NOW. OK? Baby steps! Patience. From this it can be seen that science does not know the processes of formation and behavior of black holes, and in particular the question of ignorance of the structure of the universe. The black hole is a place in the galaxy where matter is transformed back into the form of the substance AETHER from which the substance is formed. This means that matter is disintegrated into a series of processes that lead to the formation of Aether. First, gravity is the one that provokes the singularity in its work, where the processes contradict those processes that form matter. And this is the disintegration of the quark gluon plasma, the contraction of high vibration and the return of the gluon into the shape of the strings and the relaxation of them until they die and return to the form of Aethera. With these vibrations, matter becomes a vibration energy.